Our latest Walter's Choice Award goes to Lori who asked Right On The Walls to help her with decorating in time for her open house. Time was tight, but the animal-loving crew at ROTW was up to the task! 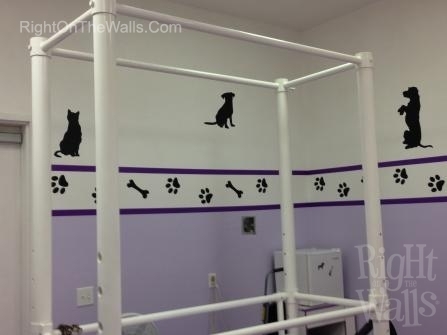 To compliment Lori's delightful pain choice, Right On The Walls sent off bones — as well as black puppy and paw print silhouettes. You can find the decals shown on our website. Lori ordered our Dog Silhouette Wall Decals and Animal Paw Print Decals in black. But you can get them in any color you like! I was in a rush for my open house and Right On The Walls went out of their way to help me out! I love their products, so easy to work with! My grooming room came out amazing ... these decals had a huge impact on our room. So easy!! And so amazing for such little effort! Aw, shucks Lori — You're so welcome. We are glad we could help make your open house a huge success by getting your order to you in time. You did an excellent job putting them up on your walls of the grooming salon. 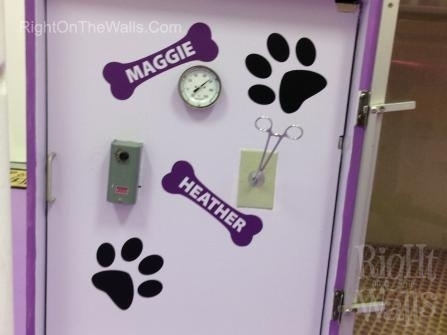 Right On The Walls has a big selection of pet and animal-related vinyl wall decals — much of it customized with your business name, or pet's name. And, of course, you always have a say in what size, color or font we make for you! 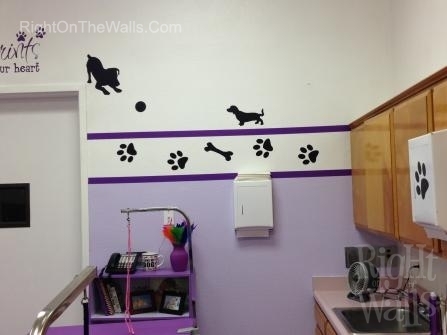 Our wall decals make it super easy to decorate your grooming salon, veterinarian office, dog sitting park or even for your pets at home.